Been teaching over 15 years. Taught at several of the best clubs in Atlanta. Played Davis cup for Ghana and was ranked to 100 in the world on the Junior Circuit. Coached some of the best juniors in Atlanta. Love coaching all levels. Come to the states on a tennis scholarship to the world famous, John Newcombe tennis academy in New Braunfels Texas. Won two doubles tournaments with former world number one Layton Hewitt. 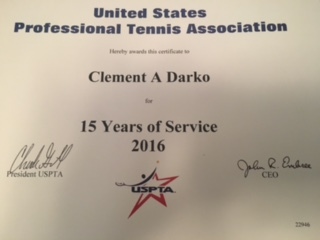 Am USPTA and GPTA certified. love to help students reach their full potential and have a joy playing the game of tennis. Fantastic Coach!! I highly recommend him. He's a great guy, very nice and calm, but also very focused on getting his students better. He's dedicated to teaching and improving his students' skill level, and he makes sure his students have fun while doing so. Overall, a great teacher, coach, and friend to have. Speaking personally, my playstyle and level have improved dramatically since I started taking lessons with him. Clement is a great tennis coach. He is able to quickly ascertain areas needing improvement and is very patient. It is easy to understand Clement's instructions. I am very pleased with the lessons he has provided. Great experience with Clement. My friend and I took our first lesson with him this past weekend, and he came to my subdivision's court, which was very convenient. We started off with form and he grew on that as the lesson went on. Clement was very patient with us, as we are not the most skilled players, but had some great tips that completely changed my hits. My friend and I are looking forward to our next lesson with him! I have really enjoyed taking team lessons with Clement . He always has new drills to keep it challenging and fun! He is also great at giving each of us constant feedback. Hope to keep taking lessons from him. Clement is a fantastic coach. He constantly gives feedback to the whole team throughout the whole lesson. I enjoy taking lessons from Clement. Clement is coaching our Alta team for several months now, although we are 8-9 ladies in lesson, each one of us feel a lot of improvement. After we started with coach Clement, our team went up in the league. he is very positive and encouraging, easy to follow and learn. I very much recommend him! Clement is my favorite tennis pro! I've been training with him for 10+ years, and he took me from beginner to a solid adult player. His style of coaching is right for me. He's not a yeller or in your face screamer. Clement is positive and quietly encouraging. He reinforces footwork and stroke technique on the spot when they break down. Our hour lessons fly by, he makes training enjoyable. Clement has am impressive tennis background that includes playing Davis Cup, so is capable of training even advanced players. Clement also trained my son in day academy for 7 years, and was equally as effective with Juniors for all the qualities I mentioned before. He gets my highest rating!! Clement is my coach, trainer, and hitting partner and he has been so for almost 15 years. During that entire time he has consistently been upbeat, positive, and a great role model. I have played tennis almost all of my life and because of my time with Clement, I am hitting better than ever. He has coached me to have a smoother swing - both backhand and forehand, and he has taught the value of having true confidence in both my tennis game and in my life. I absolutely recommend him as a tennis coach/instructor. Clement Darko has been coaching me for several months now and has transformed my game. 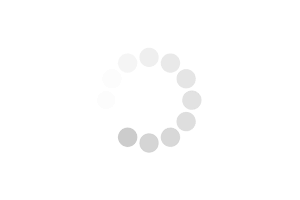 I have been playing tennis for over 5 years and hit a plateau. From our first lesson he had me work on my groundstrokes and footwork. I noticed band felt a difference right away. I have had coaching in the past but Clement is very good at focusing on details in a repetitive manner that helps build new habits and muscle memory. His comments, coaching and feedback is very specific and targeted. Easy to follow and learn. His calm demeanor is also great and he will push you physically which is where my learning zone occurs. I have friends that have also been coached by Clement that think the same. My doubles partner and I are now starting coaching sessions with him. I enjoy the game of tennis so much more and my groundstroke depth, speed and accuracy has improved. I happen to be winning more matches too but it's not about that. It's about becoming a better player and enjoying the growth journey, Clement has transformed my game and enjoyment of tennis. I highly recommend him!  I check with them about their strengths and weaknesses. What they want to work on and improve the most, how often the lessons, willingness, patience they can demonstrate to make changes. What's their specific goals and time frame to accomplish them. 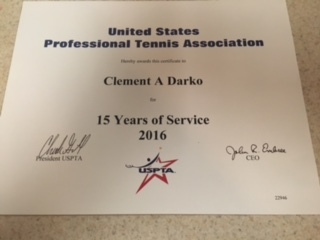 Am USPTA and GPTA certified. Both requires me to have extensive training, conferences and workshops each year to maintain my certification. Don't have a standard pricing. 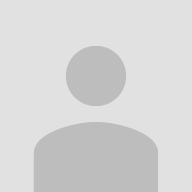 Base my rates on ages, levels, semi privates, group privates and how often the lessons are. Open to negotiations. Been playing tennis all my life and have the love and passion for it. Played professionally and decided to share my knowledge, experience and expertise to people willing to learn, listen, trust me and improve. Have work with all sorts of players. Worked with several of the top juniors in the state and southern region. Worked with beginners, adults, teams, groups. Love working with anyone willing to listen and would hard to improve their game. A student I started coaching at the age of 7, as a pure beginner, went on to win the biggest tournament in GA in the 10's and under when he was 9yrs. To look for someone with experience and have work with several proven players now and in the past. Watch the teacher give several lessons if able to. What's their main focus and purpose. How patient and flexible the teacher is.